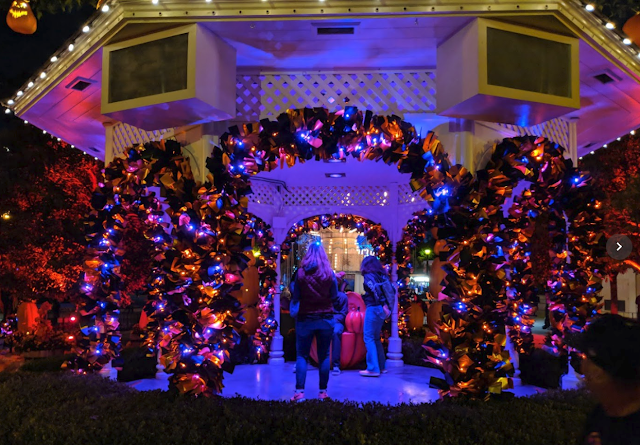 I have been going to Halloween Haunt since its inception 11 years ago--along with most other Halloween events in the area. 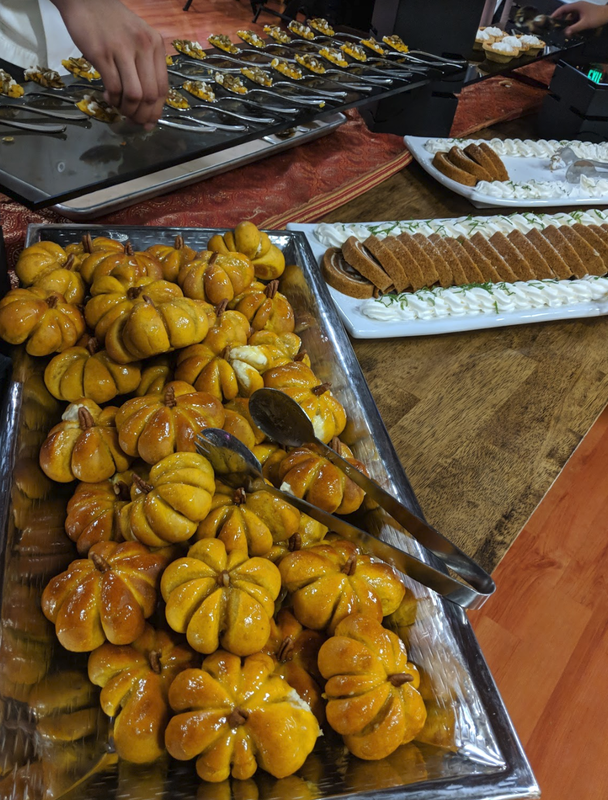 This year, they did an amazing job and overall the event is perhaps the best it has ever been! I attended the media preview day, which was also open to the public, and sampled all of the mazes and rides firsthand. One initial general comment, the decorations are far more impressive than previous years. All of the restaurants inside the park are open during the event. 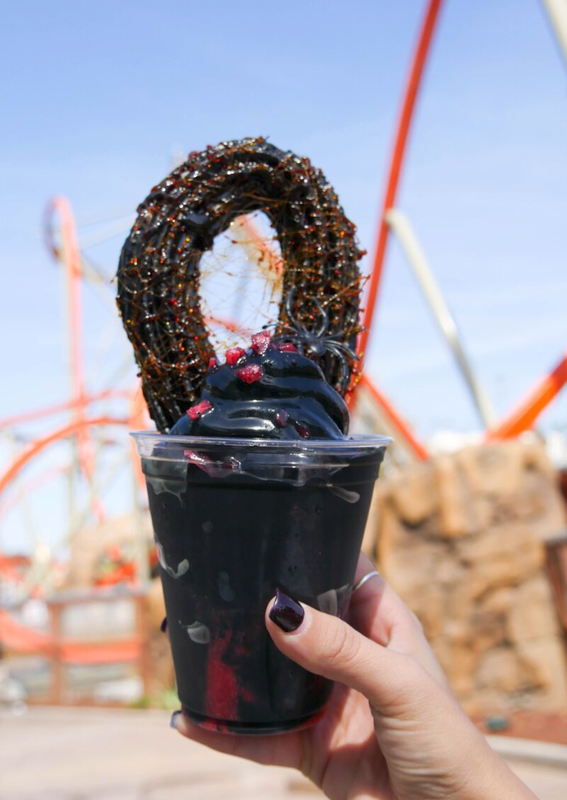 There are some special Halloween treats like the Black Widow Churro Sundae pictured below. Before the park opens, there is an all-you-can-eat "Boofet" with bloody mary grilled chicken, peppercorn tri tip, and spaghetti primavera. My favorite item were these adorable pumpkin breads stuffed with cream cheese. The "Boofet" costs $17 per person and also gets you early entry into the park. This year there are 8 mazes to choose from scattered throughout the park. To avoid backtracking, I would recommend going counter-clockwise starting with Chaos House then the Wax Museum and so on. There is one brand new maze this year called Tooth Fairy, and I found it to be the scariest maze that Great America has ever done. Production values were excellent and the actors were on point. This was easily my favorite for the 2018 season. Madame Marie's Blackout was my second favorite. While the maze itself is similar to last year, you run through it in the dark with nothing but a dinky flashlight to guide you through. Backwoods, CornStalkers, Roadkill Roadhouse, the Wax Museum Chamber of Horrors, Zombie High, and Chaos House are all back, some with minor changes. 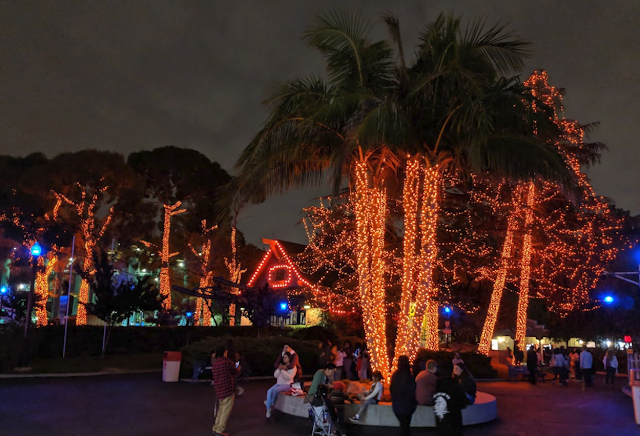 The only one I would skip is Chaos House with a nonstop annoying strobe light and skimpy decorations. It's a shame since the 3D Clown maze that preceded it was exceptional. Backwoods was my 3rd favorite, which features an open marshy atmosphere and thoughtful design and acting. 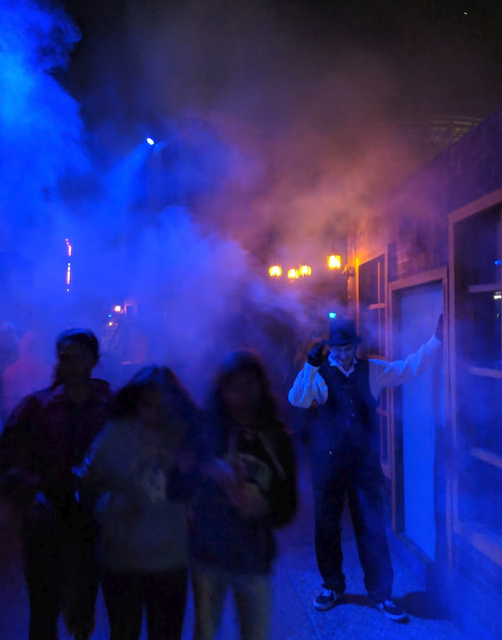 In addition to the mazes, there are three scare zones in the park where actors will scare you as you are walking around. The new one for 2018 is themed around Jack-the-ripper. 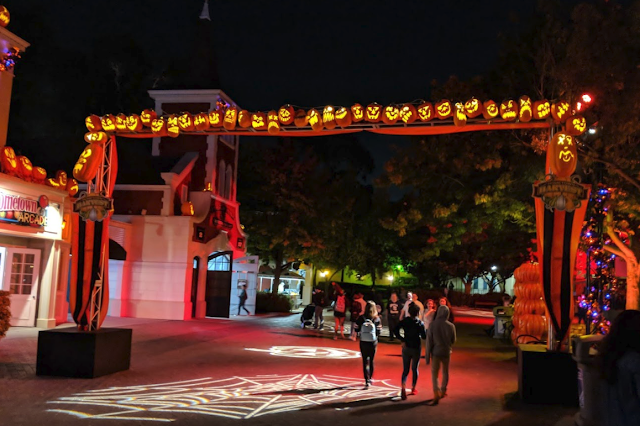 Almost every ride in the park is open for Halloween Haunt. 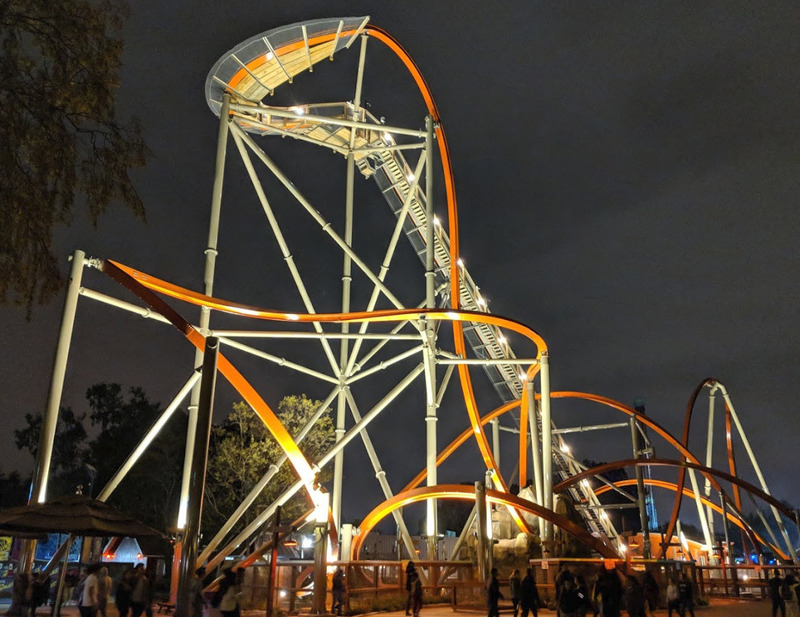 If you haven't been to the park in a while, I would recommend their newest rides such as RailBlazer (fastest coaster in the park with a 90 degree drop and many inversions, photo below), Gold Striker, and Mass Effect: New Earth. Old favorites like Flight Deck (I will always call it Top Gun in my head), The Grizzly, Psycho Mouse, Drop Zone, and the Demon are also running. They have five shows this year. 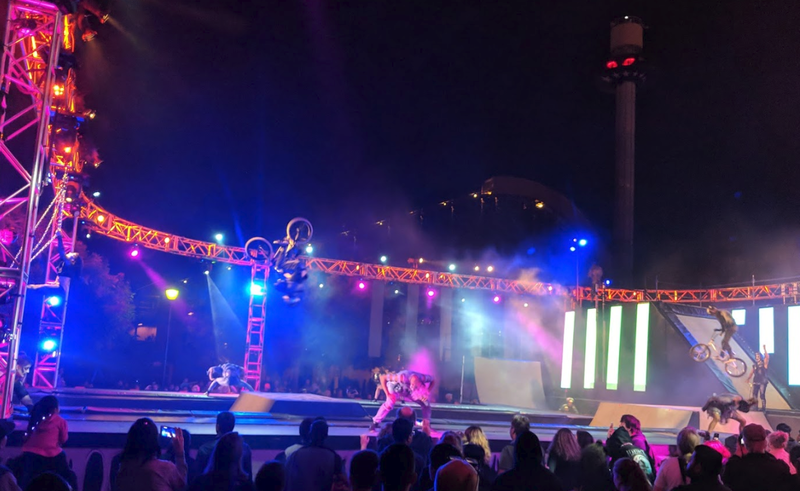 An opening ceremony, Ed Alonzo, Nytewalkers, Blood Drums, and the Sideshow. Ed Alonzo is absolutely worth seeing, especially since he has quite a bit of new material this year. It's a nice blend of magic tricks, comedy, and musical performances. Nytewalkers features amazing acrobatics and stunts in the middle of the park (photo below). Blood Drums is percussion-based musical performance and Sideshow is a series of freakish acts that will give you nightmares. In summary, Halloween Haunt has something for everyone--except kids, you really shouldn't bring them if they are under 12. The event runs on Friday, Saturday, and Sunday nights until the end of October. The hours are 7pm to 1am on Fridays and Saturday and 7pm to 12am on Sundays, which are also the least busy days. You can learn more and buy tickets over here.